Food in Southwest France: a brief gastronomical tour! Poitou and Aquitaine; Perigord, Quercy and Gascony; the Pyrenees. Bordeaux; Toulouse; Poitiers; La Rochelle; Rochefort; Cognac; St Emilion; Pauillac; Perigueux; Sarlat; Lascaux II; Bergerac; Rocamadour; Cahors; Condom; Moissac; Albi; Biarritz; Lourdes; Bayonne; Pau. 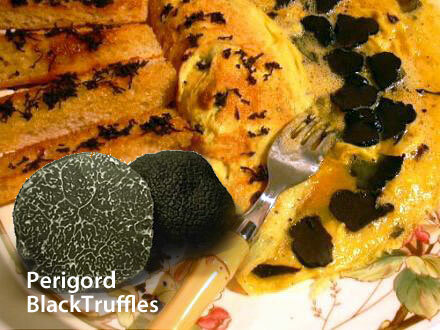 Perigord black truffles make a great omelette! Food in Southwest France sometimes appears to be the poorer cousin of grape-juice. Yes, it’s Bordeaux (and Cognac) country, the world’s largest fine wine region! Still plenty of coastline, so mussels, oysters and other seafood are prominent – "Homard Persille" is lobster terrine cooked in flavoured stock with herbs and parsley. But wine is the indispensible ingredient of cooking in the southwest ("a la bordelaise"), with foie gras and truffles in Perigord (Dordogne) and spicier dishes as you near the Pyrenees. This region is the archetypal French farming area, green and wooded and relatively flat until you approach the mountains in the south. It helps to be a carnivore around here, with geese, ducks, salt lamb and beef featuring prominently. Cassoulet is basically a thick stew made with white haricot beans, local dried sausages and a choice of duck, pork or mutton, with liberal amounts of goose fat. Duck confit (meat cooked and preserved in its own fat) is a favourite with fleshy boletus mushrooms (cepes) and garlic. Rabbit and local Agen prunes produce a fine sweet and sour stew and of course there’s always foie gras if you can ignore the way they force feed the geese to make it. All is not lost for vegetarians though, at least for rich ones, because Perigord truffles are world famous, and a fresh truffle omelette is said to be the best way to bring out their earthy yet delicate flavour. Another good choice is goat’s cheese, a regional speciality often served grilled (chevre tiede) with a salad. You can also get preserved goat’s cheese flavoured with herbs – delicious! Around the Pyrenees in the Basque and Catalán regions, periwinkles and fish stews are popular and ‘Pipérade Basque’is an omelette or scrambled eggs stirred into cooked tomatoes, onions, green peppers and garlic. Chefs in the Catalán region usually use lots of olive oil and garlic. The famous "L’ouillade" is actually a hearty soup made from, inter alia, pig’s trotters, cabbages and turnips and a little rancid lard, traditionally prepared at the beginning of the week and added to as it was consumed. How long this continued is the stuff of rural myth! 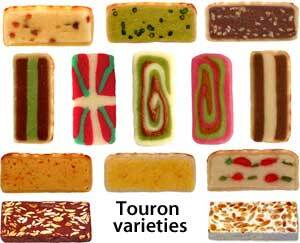 For those with a sweet tooth (yes, that includes me) the good news is "Touron", a Basque marzipan roll that comes in all kinds of colours and designs, packed with pistachios, hazelnuts and candied fruit and usually sold in slices. The choice of wine of course, is sublime, and has brought wealth to Bordeaux for hundreds of years. Its reputation is built mostly on red wines, especially those from the Médoc, Saint-Emilion, and Pomerol, but there are also the famous Sauternes (sweet white) districts. Good vintages for reds are 1988, 1989, 1990, 1995, 1996, but this is a generalisation. Apart from wine, there is, of course, Cognac and Armagnac, liquid gold distilled from white grapes (Cognac twice, Armagnac once, but they more or less stay the same time in the cask), and the local speciality aperitif Quercy Noix, made from walnuts. As I first commented, food in Southwestern France sometimes seems to run second to the wine, but eating and drinking your way through the region on your gastronomical tour may change your opinion!